New York City is one of the most vibrant and culturally rich cities in the world, with neighborhoods to match anyone's personality. Some neighborhoods offer more than others, but one in particular, Midtown, really is the center of New York. Looking at a NYC map, Midtown is physically at the center, but it is also at the center of arts & culture, dining, and a real estate revolution. Residents of Midtown are in proximity to some of the best the city has to offer in all of these categories. Midtown is close to many office buildings and transportation hubs such as Grand Central making it a convenient neighborhood to walk to work and then revel in all the cultural options afterwards. The Midtown cultural district is home to a lengthy list of art galleries, museums, and auction houses that extends into the neighboring Upper East Side. In addition to the museums and auction houses, Midtown is also home to many public art installations that one can enjoy by simply strolling through the area. Office buildings throughout Midtown East serve as art galleries of sorts, with buildings such as IBM and Jeffries serving as home to unique art pieces in their lobbies respectively. The outdoor space at the famed Seagram building, a highly utilized plaza, has been home to public art displays. This summer, we saw the sculpture "Welcome Parade" by Jean Dubuffet on display in the plaza. The Lever House has also been home to many art installation both outdoors and in the lobby as well. Jeff Koon's sculptures have called the Lever House lobby home. You may have also noticed various sculptures along the green spaces of Park Avenue, changing over the course of months and years. The Fund for Park Avenue, which is responsible for maintaining the flowers and plantings, spearheaded the sculpture displays along the avenue. These installations have been enjoyed by many, locals and tourists alike. Thank you for your interest in exploring the Midtown East area. Click here to download your complimentary guide. The culinary options in Midtown are unrivaled, with virtually everything at your finger tips including some of the most highly regarded restaurants of the city. Enjoy quaint bistros and diners along 2nd Avenue, or more upscale and trendy places along 5th and Madison Avenues. The dining scene is undergoing an exciting change, with some heavy hitters in the industry coming to the area. Major Food Group (of Carbone, Dirty French, and Sadelles fame) has been tasked with revitalizing the former Four Seasons Restaurant, which many might say is an unofficial New York City landmark. Major Food Groups slated renovation for the space includes a grill room and a modern pool room. The second notable arrival to Midtown East is celebrity chef Joel Robuchon. Robuchon has more Michelin stars than any other chef in the world, amassed from at his restaurants in culinary centers around the world. Robuchon will be opening a new restuarant and market place in the Foster + Partners development, 100 East 53rd Street. In addition to the evolution of the dining and shopping options, Midtown is also experience a real estate revolution, with the hottest, eye catching new development popping up in the neighborhood. Midtown has, in a sense, always been at the forefront of architecture and design, dating back decades. The Mid-Century design of buildings such as the United Nations and the Lever House were revolutionary at the time, standing in contract to the stone Park Avenue facades. The new developments are situated well among their architecturally pleasing neighbors. 57th Street has been a key component in the transformation of the luxury real estate market in New York, with the arrival of super-luxurious (and pricey) pads that began a competition of "who can build the tallest residential tower" in New York. Among the most famous is 432 Park Avenue, the slender square building that towers over the Manhattan skyline. If you haven't done so, get a look inside 432 Park Avenue. Other notable new development include the MoMa Tower at 53 West 53rd Street, 520 Park Avenue, and glass tower rising at 100 East 53rd Street. 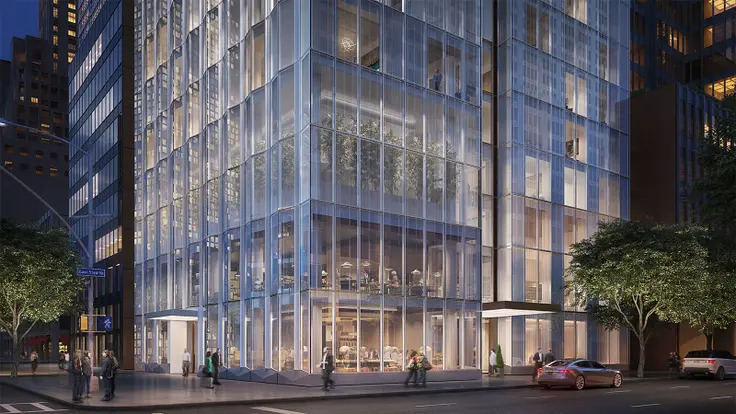 Foster + Partners are bringing their latest project in the form of a sleek, glass tower that is rising at the corner of 53rd Street and Lexington Avenue. Situated behind the landmark Seagram Building, One Hundred East Fifty Third is designed by architect Norman Foster and will stand 63 stories tall, featuring a glass curtain wall exterior. The 94 homes range in size from lofts to 3 bedroom full-floor residences. Lofts are characterized by exposed raw materials done in an elegant way such as finished concrete walls that are perfect for displaying artwork and diamond-polished high-grade concrete floors. Residences have floor-to-ceiling windows with UV protection, kitchens outfitted with Gaggenau appliances and wired brushed oak cabinets. Tower residences feature custom millwork designed by Foster + Partners, Italian Carrara marble countertops, and aquabrass fittings in the master baths. Some tower residences have private elevator entrances. The views from the tower residences are sure to be stunning! Amenities: The amenity space will be on the third and fourth floors, with a 1,200 square foot wellness center complete with sauna and steam room, a pool, and library. The restaurant by Joel Robuchon will comprise the first and second floors. There will be a gourmet market accessible to the public on the ground level and a fine dining restaurant located on the second floor. Example Availability: Residence A Floor 24: 2 Bed, 2.5 Bath comprised of 1638 square feet. $5,500,000. If you are interested in scheduling a private showing to preview 100 East 53rd Street or 151 East 58th Street, 47A, please contact The Victoria Shtainer Team.